And you could save even more because our broker is a Certified Negotiation Expert. If you are planning to sell your home within the next year, we are extending an invitation to you to receive Catalano & Associates Realty’s exclusive First Time Home Seller Guide. It has great information about staging your home to sell, the cost of selling a home, tips for home sellers, and the basic documents you need to get started…including the required Sellers Disclosure and T-47 Property Affidavit. 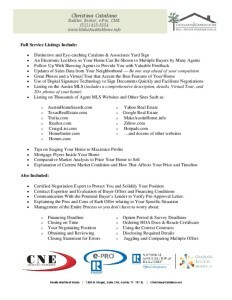 Information is your best asset, but a professional Realtor is your best ally. When you request your First Time Home Seller Guide, we will also include a $1,000 commission savings voucher you can use to minimize the cost of selling your old home, taking you one step closer to your next home which meets your needs and lifestyle better. Let Catalano & Associates Realty save you time, money, and stress while you transition to a better life in a new home that fits your needs! Give us a call today at (512)413-3554 to claim your exclusive First Time Home Seller Guide, or fill out the form below and we’ll send it out directly to your doorstep. Don’t forget to check that you would like to receive a $1,000 savings certificate!